When I was little, I dreamed of being a waitress when I grew up. It is still unclear to me what inspired this – I do come from a long line of enthusiastic Irish and Italian eaters and drinkers. Food was central to our gatherings, and all the kids were expected to help out in the kitchen. My chores frequently included setting and clearing the dinner table. I was often underfoot in the kitchen, learning how to make sauce or macaroni and cheese or tuna salad. Even as a toddler, I would occupy myself for hours with measuring cups and Tupperware on the kitchen floor. I also have vivid memories of practicing for my future career. On Thanksgiving at my grandparents’ house on Cape Cod, family members played along, whether or not they were willing, when I staged elaborate games of “restaurant,” using coasters as plates and taking orders on a pocket spiral notepad. Strangely, I have never had a food service job – despite many of my peers doing stints in waiting tables or bartending, I spent most summers in my youth working in a small non-profit. But I do see service as a cornerstone of my career – being in service to our vulnerable neighbors, and now in State service. In social work school, I studied servant leadership, a philosophy that has guided my approach to my work – a focus on sharing power instead of acquiring power. For the nine years that I worked for the RI Coalition for the Homeless, I participated in building a movement for social and economic justice, in service to individuals and families experiencing homelessness. I feel very privileged in my role in Treasury to work for and with elected leaders who are using their power to address the needs of Rhode Islanders. And, I have been blessed with family, friends and mentors who have invested in my life, so I am conscious everyday of ways I can invest in others, to be of service. 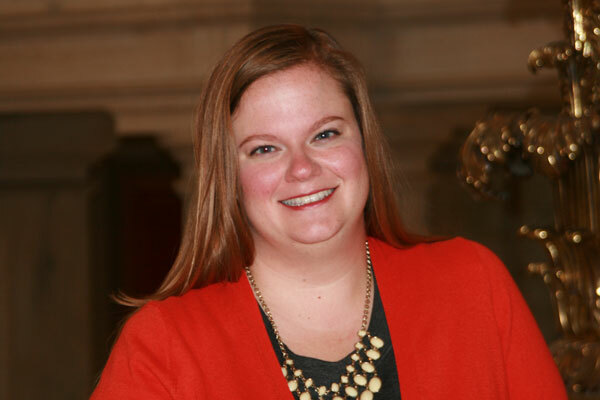 LeeAnn Byrne is the legislative director at the Office of the General Treasurer Seth Magaziner, promoting the Office’s initiatives to the Rhode Island General Assembly. Previously, she was the policy director at the Rhode Island Coalition for the Homeless, where she successfully advocated for a dedicated funding stream for housing vouchers for people experiencing homelessness, the passage of the nation’s first Homeless Bill of Rights, and the recent $50 million Housing Opportunity Bond (Question 7). Byrne received her Masters in Social Work, with a focus on policy and administration, from Rhode Island College and her Bachelors in Social Work from Providence College.